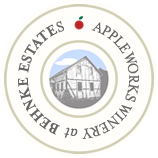 In 2002, Kevin Behnke, owner of Behnke Estates, acquired the picturesque Apple Works Orchard in Germantown, Wisconsin. As its name indicates, Apple Works Winery is located on what was previously an orchard, dating back some thirty years. At its new home, Apple Works Winery and Behnke Estates set out to produce more than just apple related products. With a commitment to honor the property’s rich history, the Apple Works name remained, as well as many of the original buildings. It’s with great passion, and relentless dedication, that the Behnke family sets out to produce some of the finest wines from America’s Heartland, and the world.